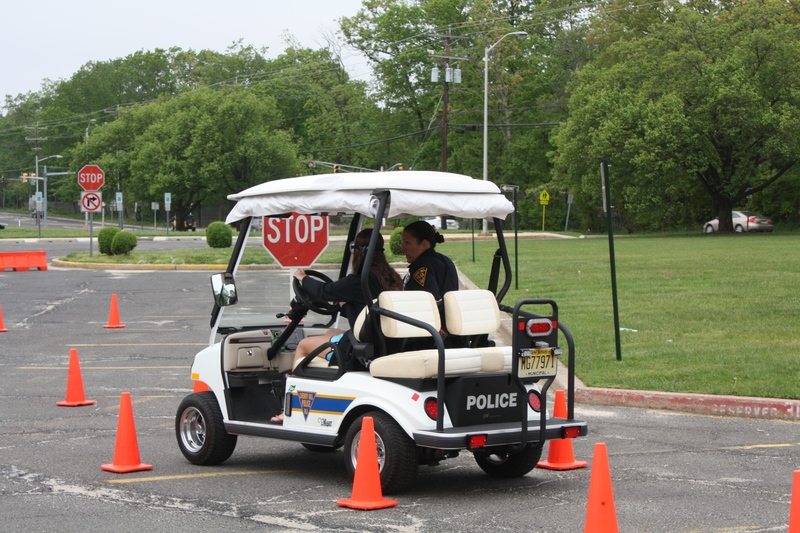 The Cherry Hill Police Department gave seniors at Cherry Hill High School East a hands-on lesson about the dangers of distracted and impaired driving during a special session at the school on Wednesday, May 14. As part of the department’s Impaired Driving Simulator Program, officers from the Department's Traffic Safety Unit set up a series of interactive demonstrations meant to show new drivers how drunk or distracted driving can affect decision making, depth perception and reaction time behind the wheel. Several students were given the chance to drive a the Department's low-speed Impaired Driving Simulation vehicle through an obstacle course - first without distraction, and then while wearing a pair of "fatal vision" goggles or texting on a cell phone. Others took part in mock sobriety checkpoints, while other students played skill games to test their depth perception and coordination. The CHPD provides educational outreach programs to Cherry Hill High School students throughout the year, including a crash simulation scheduled at Cherry Hill East on May 28 and again at Cherry Hill West on June 3. The Traffic Safety Unit participates in a number of state and national safety campaigns throughout the year, including Click it or Ticket, Buckle Up South Jersey, Pedestrian Safety operations, and Over the Limit Under Arrest. The Department launched the Impaired Driving Simulator Program in 2010, through a sponsorship with Wegman's, Home Depot, All-State Insurance, and the Cherry Hill Alliance on Alcohol and Drug Abuse. For more information, visit the Cherry Hill Police Department online. Click the link below to read more about the program in this week's Cherry Hill Sun.